In Germans into Nazis, Peter Fritzsche examines four moments in German history between 1914 and 1933 that exemplify how the Nazi movement became possible. He looks at the mass crowds of July-August 1914 when Germany mobilized at the beginning of the Great War, the crowds in 1918 following military defeat, the crowds after Hitler was appointed Chancellor, and the May Day celebration in 1933. Like Ian Kershaw, Fritzsche argues that the war made the Nazi movement possible. Never before August 1914 had so many people in Germany mobilized for a single cause. This gave those early “August days” a populist feel. German citizens of all social strata, backgrounds, and beliefs, including Adolf Hitler, stood together in Berlin, attempting to form a national community, the Volksgemeinschaft. Fritzsche posits that this national community, unlike previous, rigid Victorian social structures, grabbed a foothold in the German imagination. Germans began reimagining the nation and constructed a national identity that only could have emerged through the war and its legacy. Germans turned into Nazis slowly through grassroots movements and the waning legitimacy of previous conceptions of the German nation. During the war, the Kaiserreich lost legitimacy because of the inability to adequately take care of its citizens. Food shortages and strikes became the norm and Germans began to remember those August days when a unified German Volk stood in the crowds. 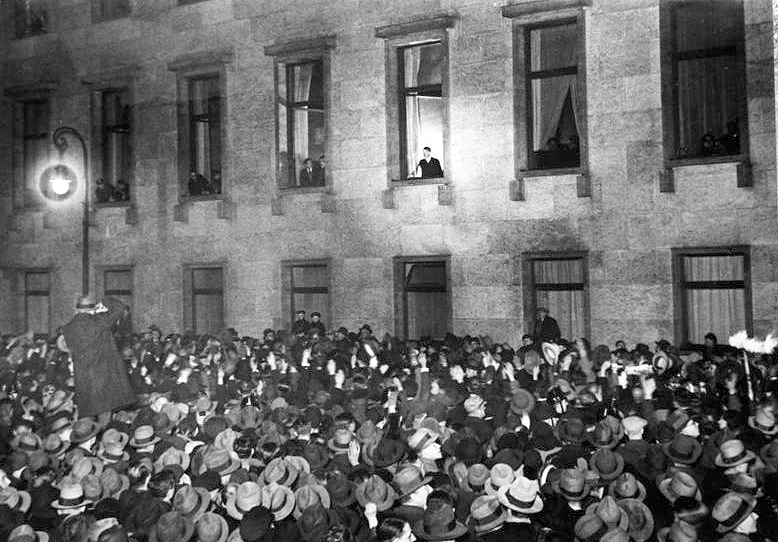 Fritzsche argues that after the war even larger crowds gathered and “the definitive measure of Germany’s political figure had now become the people, the great curbside republic of soldiers, workers, and consumers.” More extensively than during the Kaiserreich, the middle classes and lower classes expressed their collective voice together through mass movements. They believed that interest groups and political parties served exclusionary masters and that a truly völkisch movement would eradicate both the noble order and the fragmented political nature of the Weimar Republic Increasingly during the 1920s Germans left their political parties to join the Nazis. Fritzsche convincingly argues that a simple homogenous explanation cannot account for the Nazis’ popularity. He explains that the war broke apart old notions of what it meant to be German. The Kaiser’s abdication allowed for a power vacuum. The new republic incorporated a political regime that Germans could stand against together much as they stood together in August 1914 to fight for a unified Germany. And importantly, according to Fritzsche, Paul von Hindenburg’s election to the presidency in 1925 reflected the national mood and ushered in a window of opportunity for a Hitler to emerge. Hindenburg represented the war-soldier culture and national unity that enabled Germans to reimagine the nation. Fritzsche argues that the Nazis exploited this reimagination better than anyone else. They helped invent and constantly alluded to the Volksgemeinschaft that the people wanted. The Nazis travelled to thousands of towns and cities, speaking directly to the German people and uniting rather than dividing them. While the conservative and liberal parties served special interests, the Nazis tried to maintain a broad, all-encompassing agenda that had mass appeal, and excluding Jews and Communists, whom the majority despised. Mass appeal caused social democrats, conservatives, liberals, rich and poor to vote Nazi. Instead of appealing to violent anti-semitism, they spoke of programs to put all of the unemployed back to work. They spoke of strengthening the nation and ending the Communist threat from within. Women turned Nazi because they thought that National Socialism presented them with better opportunities to return to the labor force, serve the community, and have a voice in the new national community. In other words, the Nazis appealed to the populist revolts that took place just before and just after the war. 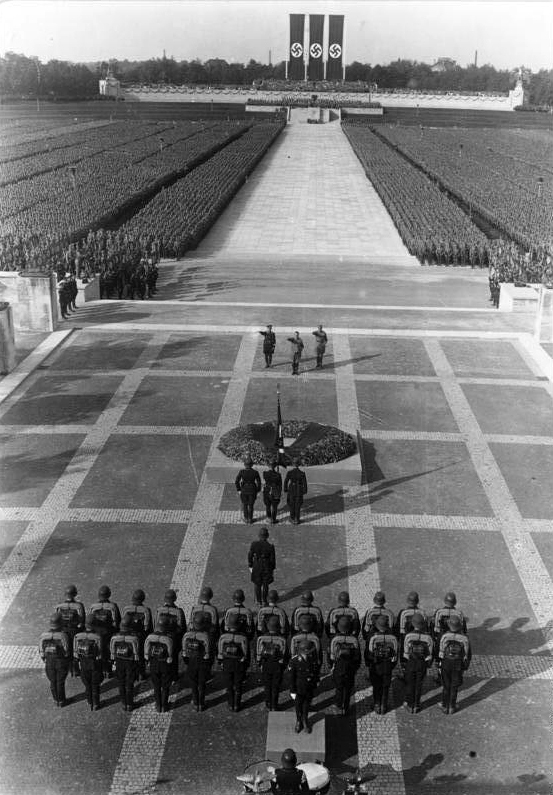 Thus Nazism “was rooted in the imagination.” It was not a movement solely against the Versailles Treaty at the end of World War I or for anti-semitism, but a movement that spoke to the broad national community that wanted to break from the old and create a new Volksstaat or German nation. 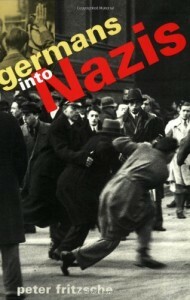 Fritzsche’s prose is easily understandable and anyone interested in German or Nazi history will enjoy this book. Germans into Nazi remains one of the quintessential works on the origins of the Nazi party.